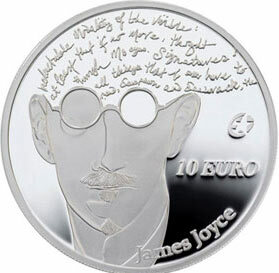 The Irish mint offered a clue to Joyce's hidden influences by deliberately misquoting him on the 'Hidden Eye' 10 euro coin, alerting literary detectives everywhere to the mystery and conspiracy shrouding the early Irish novel. Many Irish Oxfordian scholars, seeking to turn their expert detective techniques onto other authorship topics, have wondered about the antecedents of Portrait of the Artist as a Young Man and Finnegan's Wake. Some have spent years looking at the 19C novel for traces of a tradition which could produce Ulysses, a book that orthodox scholars accept as the greatest novel of the 20C, seemingly out of nowhere. It is a commonplace assumption, among students of Irish literature, that the great Irish novelists of the 19C were forced, like many of their English counterparts, to write under a pseudonym or directly pass the credit for their work to another, a front man who dealt with the business of getting their novels into print. Irish authorship studies are still in their infancy but a promising trial has opened with new work by leading Irish scholar, Roger Slightmatter, who has been examining the career of an Irish author, Finn Liam Birr, born in 1793 in County Offaly. Birr wrote poetry for the Killarney Bugle which was noted for its pioneering verse forms, like the Limerick stanza, which Birr himself invented in 1799 at the age of six. His family were forced to flee Ireland in the face of cruel British oppression and like many Irish families found themselves in France, where the young prodigy may have come instantly to the notice of the Emporer Napoleon and his Irish-loving wife Josephine, or Joe as Finn probably knew her. Napoleon had a well known technique of getting unwanted suitors out of Joe's way by putting them in the front line so it is eminently possible that young Finn may have found himself on a horse, facing the hated English in Napoleon's most famous battle, Waterloo. Our link is complete and the evidence piles up. No Frenchmen would mention potatoes in polite society yet Flaubert (or Finn as we may now call him) mentions potatoes 193 times in The Charterhouse of Parma and an incredible 217 times in his tale of celtic infidelity, Madame B O'Vary whose cryptic title is now revealed for all to see. Orthodox scholars, never keen to change a word of their established theories, are looking askance at these connections but Professor Ivan Straightlace of Cambridge University* describes them as "promising"**. What no one can deny is a whole new field of study has opened, bringing the Irish 19C novel to the fore. * Cambridge University, Paseo Ingles, Belize. ** Full quote "The ideas are execrable, either pure fantasy or pure ignorance but the craic sounds promising"